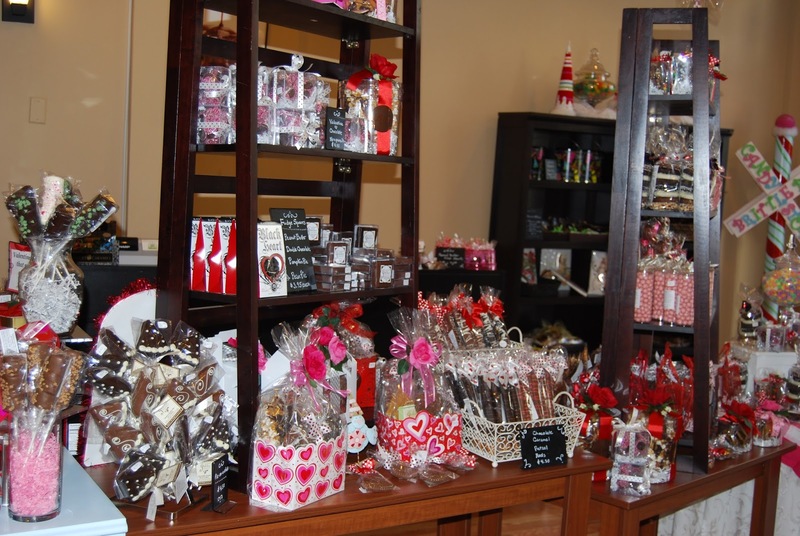 On Friday, February 5, my husband and I enjoyed a rare date night, but rather than dinner and a movie, we participated in a chocolate and wine tasting event in downtown Mechanicsburg. Our first stop was at Brittle Bark where the owner gave a very informative presentation about the process of chocolate making and the different types of chocolate. Did you know that there are 20 to 50 cacao beans per pod and that it takes anywhere to 2 to 5 pods to produce one 3.5 ounce chocolate bar? We then sampled three “flights” of dark chocolate for tasting. The first flight featured chocolate from three different countries – Ecuador, Italy and Switzerland. My favorite was from Italy with 51% cacao. The second flight provided three different samples from Ghirardelli, each with a different cocoa mass. This time, my favorite was Twilight Delight, which offered a more intense flavor. The third flight kept our taste buds primed with four samples from various mass-produced brands (Wilbur, Cadbury, Hershey and Mars) that each have the same cocoa mass. I enjoyed the Wilbur Bronze Medal. Now that we had a slight sugar high, we walked next door to Larsen Meadworks and sampled their offerings. We tried the sparkling melomels, hopped meads, and their cello meads. Mead is wine made with honey and a variety of fruits, spices, grains or hops. My favorite as the Honey Hop Wine which was light and refreshing, especially after all those dark chocolates. My husband’s favorite was Spicy Wife Champagne, which was flavored with jalapeno. Next time you are in Mechanicsburg, be sure to stop by these two great locations and enjoy the samples! You won’t be disappointed.